GLW is designed for students, teachers, teacher educators, non-profit personnel and those in the corporate world. We seek to empower leaders in these communities. 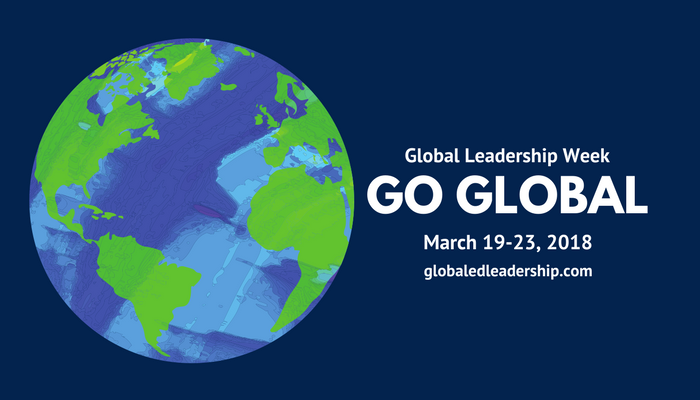 During Global Leadership Week, partner organizations, companies, school districts and individual schools will design and host virtual events to showcase thought leadership on global education. These events will be listed on a GLW calendar posted to our website. Our event hashtag is #globaled18 and you can follow conversations about GLW on Twitter. During Global Leadership Week, partner organizations, companies, school districts and individual schools will design and host their own virtual events to showcase thought leadership. Existing events are also welcomed. These events will be listed on the GLW calendar posted to our website. Submit your activity at any time and we’ll promote it. This webinar introduces three Stanford-designed online courses for high school students in the United States that leverage digital learning to develop global competence and diverse perspectives. The focus is driven by the following essential question: how do we cultivate global citizens through digital learning? Our objectives are to introduce teachers and students to innovative online courses — the Reischauer Scholars Program, Sejong Korean Scholars Program, and China Scholars Program — that connect high school students in the United States to content on Japan, Korea, and China, respectively. #Edtechchat is a weekly Twitter chat discussing all things education technology related. This chat will discuss using edtech to foster global competency with guest moderator Lucy Gray @elemenous. This presentation showcases our international collaborations developing multilingual and multicultural multimedia project using mobile devices in teacher education; offers creative strategies for producing mobile apps with youth and developing educational app integrating world languages and 21st century skills; provides the results of participatory action research project among pre-service teachers; describes participants’ reactions and experiences with new technologies and showcases their multimedia projects and digital stories. By collaborating with educators and students in Azerbaijan and in the US, we conducted an action research study and co-developed research-based multilingual app that promotes world literature, history, and culture. In conclusion, we explore how the use of educational apps and handheld devices in global education combines knowledge, reflection, and action; promotes global literacies; and prepares the new generation to be responsible members of a multicultural, global society. Know My World would like to know how different classrooms are leading the conversation of Global Competence in different cultures and countries. The Know My World BeingGlobal project is a collective contribution of statements and artwork from classrooms around the globe that answers the prompt: What does it mean to be a member of the global community? Contribute to our collective, view the video release of the classroom responses, talk about it on Twitter #knowmyworld on March 21st at 7pm EST. Explore with the MY HERO Team ways that you can increase global understanding, encourage cross-cultural awareness, and develop skills in digital media production in the theme of heroism. This workshop is for teachers and students! Register for this gototraining session and you will receive a link to join the session. This is an interactive, online chat open to anyone around the world who would like to discuss Global Leadership. Hosted by the Center for Global Education at the Asia Society, it will be led by the NEA Foundation and the Global Education Conference Network (GlobalEd Events). Log in to Twitter and then type #Globaledchat into the search box. Click on latest and then join the conversation! We are co-hosting a face-to-face summit with ASCD. This special networking event will take place on March 23, 2018 in Boston, Massachusetts. Paid registration is required and space is limited. We are nearly sold out, so register soon! A live stream of portions of our Summit will be available on our Facebook page. Additionally, the public can join the Global Leadership Summit Participate portal to find resources for this event. This is our third annual Global Leadership Summit and you can view previous Summit recordings below.